Ex & Post presents the works of 14 contemporary photomedia artists based in Eastern Europe. Investigating the many cultural, economical and geographical connections between these countries, the exhibition goes beyond the clichés and exposes the intricacies of this political hot spot. This exhibition features Andrej Balco, Tamás Dezső, Andrea Diefenbach, Krisztina Erdei, Kirill Golovchenko, Ivars Gravlejs, Iosif Kiraly, Rafal Milach, Marge Monko, Vesselina Nikolaeva, Lucia Nimcova, Tehnica Schweiz, Saša Tkačenko and Iveta Vaivode. 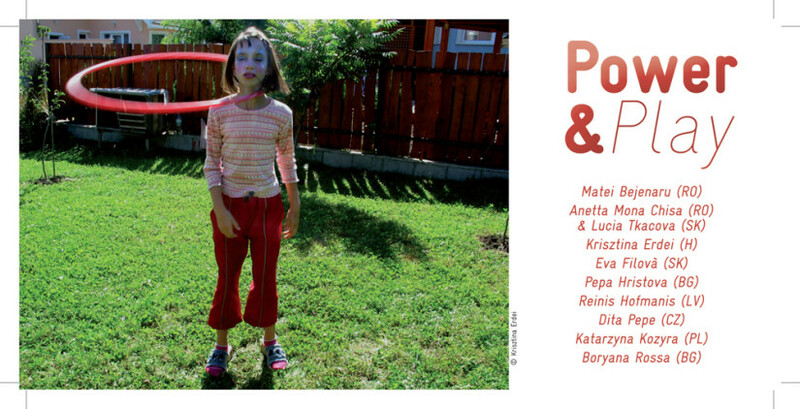 Curated by Sàri Stenczer and coordinated by Krisztina Erdei (Photolumen, Budapest) in collaboration with ACP. sustenance and survival for individuals, small groups or a whole society, that have emerged primarily but not exclusively within art projects and initiatives launched by artists. Utopias, an ever unreachable ideal world and the other side of the coin, dystopias, the nightmare of a dark, fearful era have been present all along known human history. However, in the recent past there has been an inevitable abundance of theories forecasting a collapse, and, parallel or maybe even as a response to these, appeared agricultural production, self sustenance and return to nature as more optimistic, counter­utopian ideas. This is not so much an artistic impulse, but a social phenomenon, which however interests many socially-engaged artists. The event will be accompanied by the screening of Paths Through Utopias (director: Isabelle Fremeaux, John Jordan). The buffet during the event will be organized by the contributors of the publication from their own produces. Between 2004 and 2012 the Foundation ran an international exhibition space in Budapest: the Lumen Gallery. As of 2012, the Lumen Committee has opened a new chapter. 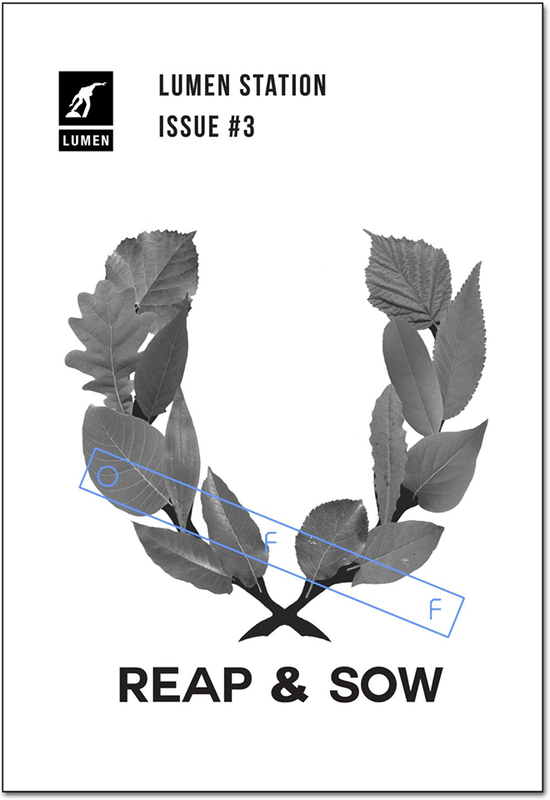 The monthly solo shows are substituted by the Lumen Station program, the publishing program of the Lumen Foundation. Within this framework a single project or a general topic is chosen and focused upon in a publication. Instead of the artwork and the exhibition, the artistic process and its context are put into spotlight. The publication is released in the framework of the Off­Biennale Budapest. The theme of the sixth cycle of the Prix Pictet is Disorder. The theme was announced at a Reception at the Musée d’Art Moderne de La Ville in Paris, during the annual Paris Photo photography fair. The work of the finalists selected for the sixth cycle will be showcased in an exhibition at the Musée d’Art Moderne da la Ville de Paris in November 2015, at which time the winner will be announced. 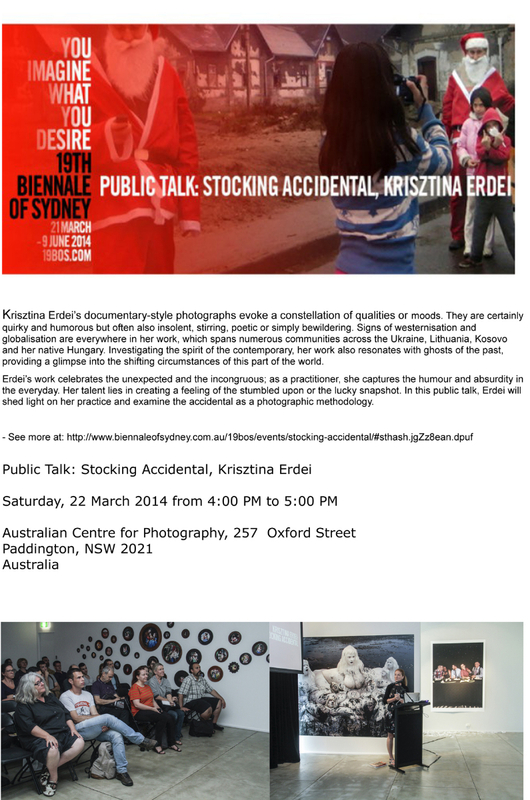 Brody ArtYard is pleased to announce the opening of Krisztina Erdei’s photography exhibition. 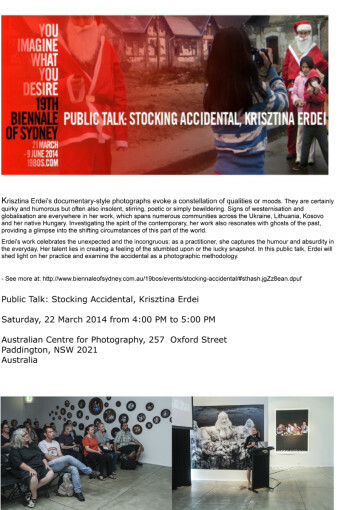 Erdei is one of the 2 Hungarian artists presented at this year’s (19th) Sydney Biennale. 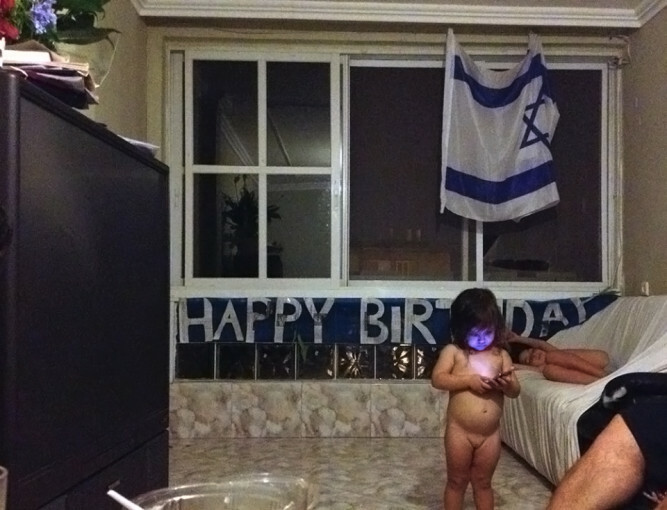 Her documentary-style photographs are quirky and humorous but also insolent, stirring, poetic or simply bewildering. 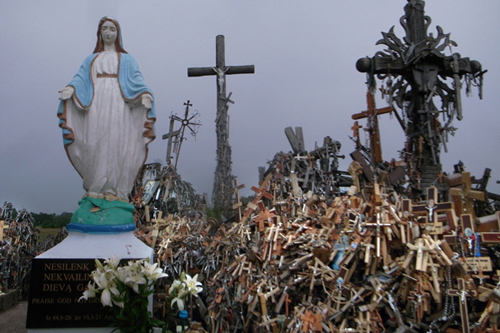 Spanning communities across Ukraine, Lithuania, Kosovo and Hungary, her work provides a glimpse into the shifting circumstances of this region. 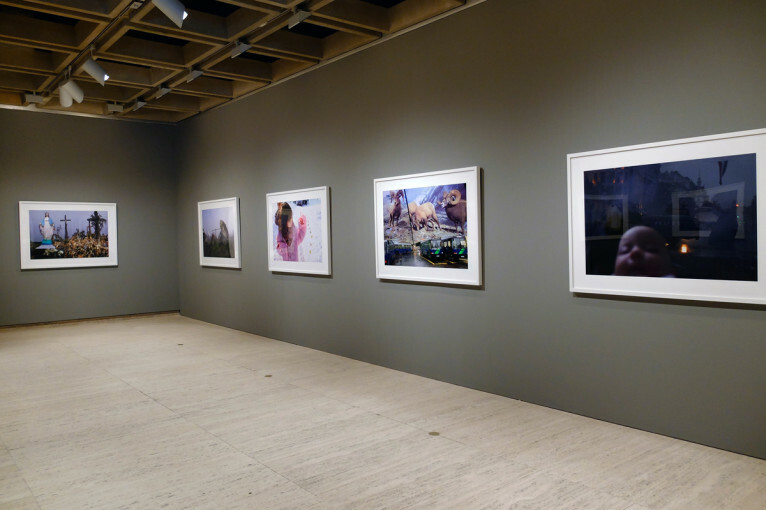 Erdei exhibited extensively abroad and was shortlisted for the 7th BMW-Paris Photo Prize in 2010. She is a founding member of the Lumen Photography Foundation, created in 2002 to nurture an experimental, international platform for photographic art in Hungary. Exhibition can be viewed from July 24th to September 24th. 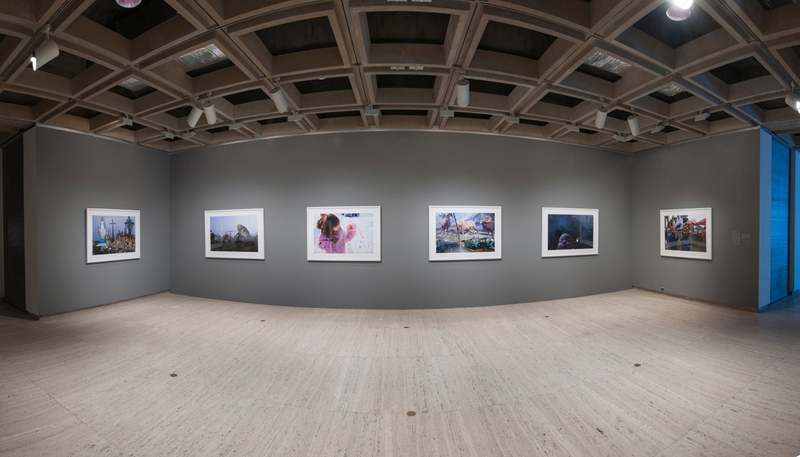 The 19th Biennale of Sydney: You Imagine What You Desire presented the work of 92 artists from 31 countries free to the public over a three-month period. 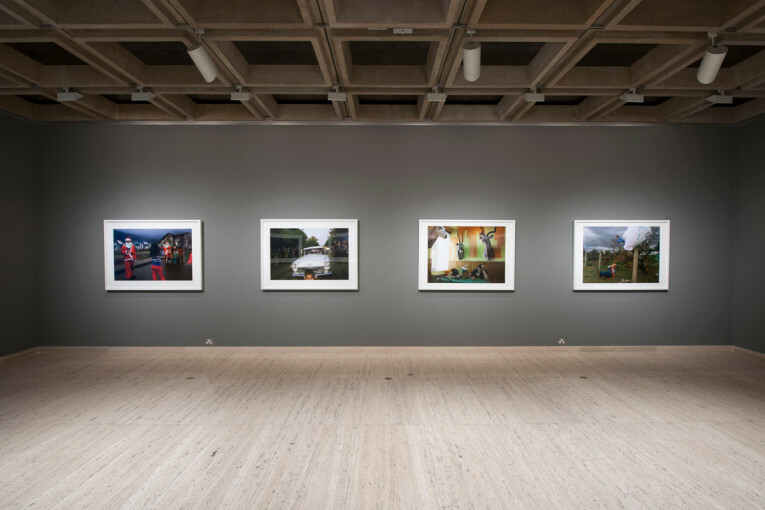 Curated by Juliana Engberg, the exhibition was presented at various partner venues including the Art Gallery of New South Wales, Artspace, Carriageworks, Cockatoo Island and the Museum of Contemporary Art Australia. Other works and events were experienced at various locations throughout the city, including Henrik Håkansson’s epic, episodic film and orchestral performance work, THE END (2011 and 2014), which was presented at Pier 2/3 in Walsh Bay. This year, more than 623,000 visited the Biennale partner venues, including nearly 125,000 from overseas, the highest international visitation numbers recorded in the Biennale’s 41-year history. In addition, audiences also experienced outdoor works by Nathan Coley on the Eastern Apron of Cockatoo Island, and the building exteriors of the Art Gallery of New South Wales and Museum of Contemporary Art Australia, as well as numerous performance works in public spaces. The photography exhibition Power & Play will take place in the framework in the fifth edition of Summer of Photography. 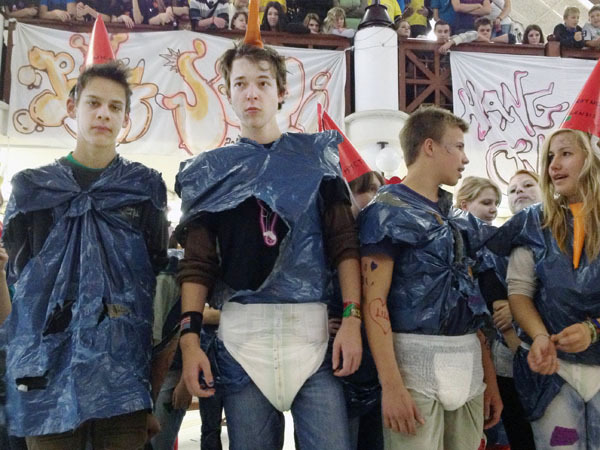 This year the main theme will be ‘gender’. The goal is to encourage debate on the position of men and women in our contemporary society. 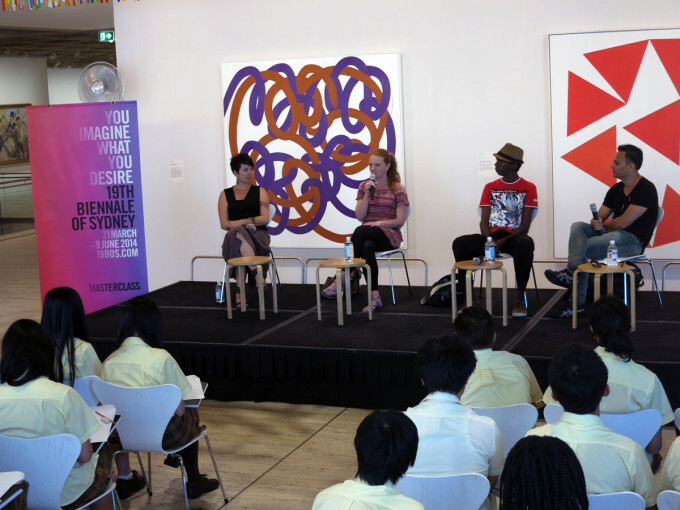 This youth program initiative gives high school students the opportunity to participate in a lively debate and to question Biennale artists and arts specialists on current art issues. The forum is followed by a sneak preview of the 19th Biennale led by Gallery educators. This project was made possible with generous assistance from the Nelson Meers Foundation. Born in Szeged (Hungary) and presently living in Budapest, Krisztina Erdei graduated from the School of Philosophy and the School of Political Studies at the University of Szeged, and also studied film theory and visual education at Loránd Eötvös University (Budapest). A founding member and curator of Lumen Photography Foundation (www.photolumen.hu) created in 2002. Erdei’s work will be exhibited in the upcoming Sydney Biennale. PSM is pleased to welcome her to the 2014 PSM Public Lecture Series. These photos were taken in the Northernmost city of Israel, close to the border with Lebanon. As I was getting acquainted with relatives and friends in a neighborhood at the edge of Nahariyya, I collected stories that ended in homes–abandoned one day or another, objects lost and memories too remote. One can see a long lost object that had been left in the abandoned home of the people taken away, but was then rescued and returned by the neighbors, an image recreated following very specific instructions, a peculiar custom that cannot be discussed in rational terms, and a visit in the junior museum of holocaust survivors. And the rest of it is just quotidian life, as it surrounds all of this.